With 6 feet of space to work with, homeowners and designers have plenty of room to incorporate up to a 67" stand-alone tub. That's a nice big tub, very capable of fitting large or tall bodies. As discussed in our article on selecting the right size tub for the space, you'll want to make sure you are leaving roughly 6" of additional "padding" for the ends of the tubs such that the tub sides are not touching the walls. This not only allows room for the faucet (for ended tubs), but also ensures you'll be able to clean around the tub. Allowing for that padding means that a 66" tub is the ideal length for a 72" opening. In an effort to maximize every last inch, Pelham & White 66" tubs are actually produced at just under 67", but are still intended for 72" openings. Always keep in mind that sometimes bathrooms look the best with slightly smaller tubs than what can technically fit. 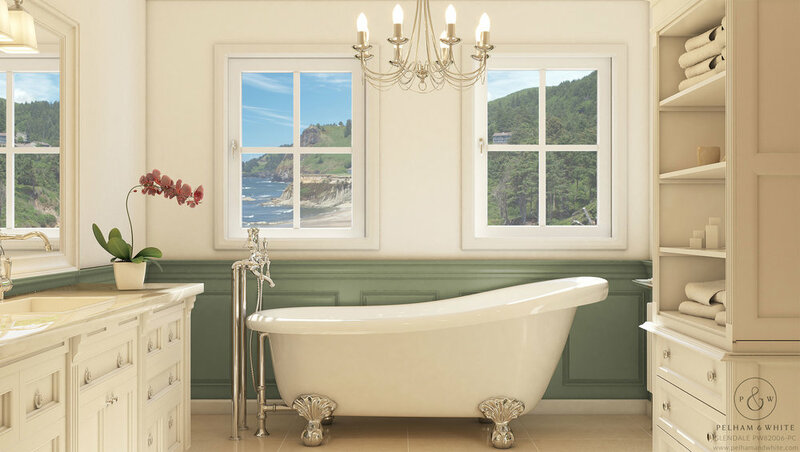 The tub and areas immediately around the tub should consume roughly 30% to 40% of the available square footage. So if you have a nice large space for the tub, but an otherwise smaller bathroom, consider a 60" tub instead.